These concepts will get you through anything — if you know how to use them. Spiritual Workout is nothing more than the relentless application of these ancient and universally spiritual concepts to the nitty gritty of everyday life. If you look at this list of 15 concepts and say, yes, I believe in them, yes, I would like to be better at practicing them, then I dare say you are in the right place. 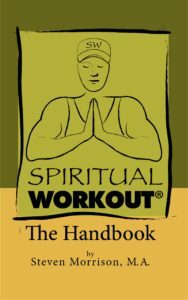 The Spiritual Workout Handbook is a concept-by-concept description of the Spiritual Workout practice in action.